MD students in the Community/Urban Health Scholarly Concentration at the George Washington University (GW) School of Medicine and Health Sciences (SMHS) who hope to one day integrate clinical and population health care received sage advice from someone who has done just that and reached the upper echelons in the field. The counsel: Take your experience with patients and use that to develop responsible solutions to public health problems. SMHS offers nine specific tracks of study for students, called Scholarly Concentrations, which serve as educational programs that enrich the students’ experiences. 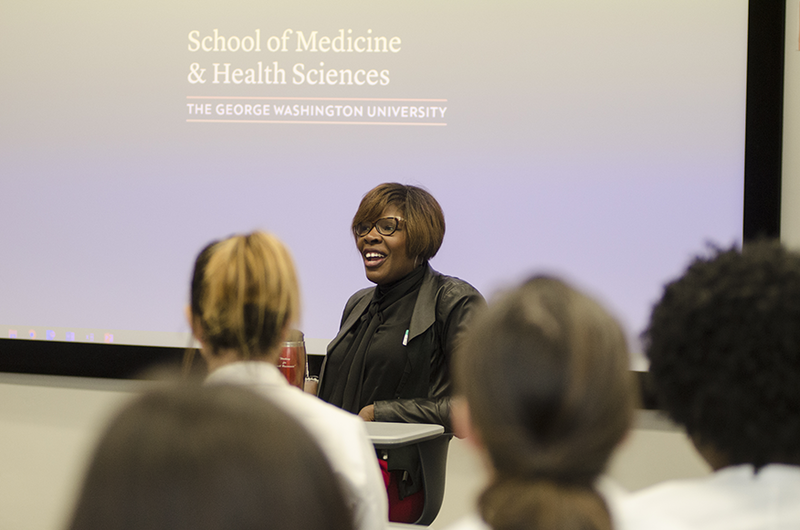 During her residency at the University of Maryland’s Department of Family Medicine, where she served as chief resident, Nesbitt said she became increasingly interested in the social contexts in which her patients lived and how that social context impacted their ability to be successful to the care plans she developed for them. This drove a desire in Nesbitt to help manage patient issues not only at a clinical level, but also at a population health level. Now she has the teams and the data to analyze how health care is used in D.C., and what policies and programs can help improve care. As an example, Nesbitt pointed to the perception that residents in Wards 7 and 8 don’t have access to proper primary care. In reality, she noted, a high number of Medicaid patients in those wards do receive primary care. But there’s a challenge: People in Wards 7 and 8 are traveling to other areas of the city for health care services. She added that the students should take advantage of all the Clinical Public Health curriculum including seminars, talks, and other resources GW is offering them.